2015 Chappaqua Children’s Book Festival! Posted on September 22, 2015 by Mr. H Posted in Other News	. Catch me at the 2015 Chappaqua Children’s Book Festival on Saturday, October 3rd, from 10am–4pm at Bell Middle School in Chappaqua, New York. I’ll be there all day, signing and selling books, chatting with fans, and at noon, doing a reading from The Hero’s Guide to Saving Your Kingdom. As awesome as I am, though, I’m not the only attraction. 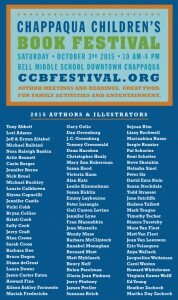 Check out the amazing list of other authors who will also be there. Yeah, I know—it’s very tiny writing. But believe me, my name is on there. Click over to the festival website to see a much more readable version. And then come visit me there! Welcome to the New Christopherhealy.com! Posted on September 21, 2015 by Mr. H Posted in Other News	. Aaaaaaaaaaaand we’re back. Sorry that took a while, folks. But I hope you’ll agree that the site is now much nicer than it was back in July. For one thing, it’s a whole lot neater. Way less cluttered. It should be (I hope!) easier to navigate. And while old visitors are not going to find a ton of new content yet—it’s coming. Expect more frequent blog posts, monthly-ish contests, reader challenges, and some other random bits of silliness to be forthcoming. The first big new addition is already here: CONTESTS! Check out—and enter!—our inaugural contest, in which I challenge you to draw the previously-never-illustrated character of Reginald, Prince Frederic’s stalwart servant. You could win some signed books! And, hey, if you have any suggestions for new features you’d like to see on this site—send ’em my way! Email me at chris@christopherhealy.com. Or just click the tiny envelope icon in the upper left corner. Stay tuned also, for news on the upcoming relaunch of OfficialHerosGuide.com, which is also currently under renovation. And thanks for sticking with me!